This is a new fully assembled and working six-digit nixie clock. There is an easily selectable jumper for jukebox effect, it is also on the right side of the clock, just remove it to enable the jukebox effect every 10 minutes. New FACTORY matched quad (set of four) of JJ 7591 7591S tube. These are found in the McIntosh MC225, Ampeg and Fisher amplifiers. Why settle for NOS tubes of unknown quality when you can have these tubes that are burned in for 24 hours and then bias matched for plate current. Deck B De-spools the tape a little farther than normal when stopping. A great high end deck with relay recording capabilities. Both Decks Record! High End Sony Stereo Cassette Deck TC-WR690. Replaced Cracked Gears (Deck A). Up for auction: Vintage pair of Realistic Electrostat-2a speakers in good condition. I plugged them into a stereo and they both had good sound. Please see pictures for more details and feel free to email with any questions. We are an authorized dealer for New Sensor products including Sovtek, Electro-Harmonix, Mullard, Tung-Sol and Genalex. These are as close to the original Genalex KT88s as you could possibly get. Made in Russia by New Sensor (Electro-Harmonix). A representative picture is shown. They are made by the Famous Russian Reflector factory, 6n3c's designed for up to 50 watts/pair of 6L6s. Thus, the current draw for a NOS 6V6GT should be between about 41ma and 53ma. A higher value is OK if not too high. 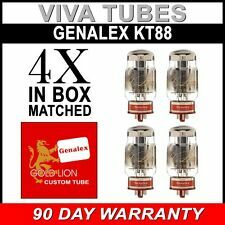 - Matched Pair of GE 6V6GT Tubes in original or white box. These two tubes are closely matched at 57.85ma and 57.4ma respectively. Date codes vary. They are tested and matched using a state of the art RoeTest professional computer tube testing system. New set of four Electro-Harmonix 12AX7 tubes. These are difficult to find at a reasonable price, so this is an opportunity to obtain a world class tube at a price that won't break the bank. They are all recent date codes. New Listing*PAIR* Infinity EMIT Ribbon Tweeters! 490125! (Pair 490125 Infinity EMIT ribbon tweeters -- really nice condx. Left tweeter has a few light scratches that have been blacked out. Sorry to shout -- ;<) -- but folks need to read this! Owned 40 Infinity speakers through the years. 1 x IN-14 Soviet Nixie tube. Tubes manufactured in 70s and early 80s. (Check picture # 6: to the left is the '76 tube, to the right is '79 tube.). In later tubes the horizontal line of digit "4" protrudes past the vertical line. New set of two Electro-Harmonix 12AX7 tubes. These are difficult to find at a reasonable price, so this is an opportunity to obtain a world class tube at a price that won't break the bank. This includes poor print, oxidized pins, faint discoloration, or poorly box. Condition : Used tubes testing above where 1650 on a hickok 6000 is NOS. 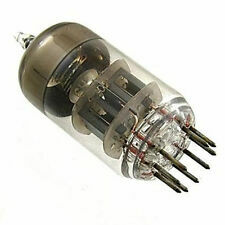 Type:Electronic Vacuum Tube. Complete visual inspection. FOR SALE : FM to AM Converter Transmitter. --Plays channels on FM- no longer has to be confined to talk radio on AM channels! No installation required! Takes standard PP3 9 Volt battery for use when power is not available. As pictured. They're steel tube made, safety and comfortable appearance. New set of three Tung-Sol 12AX7 tubes. These are difficult to find at a reasonable price, so this is an opportunity to obtain a world class tube at a price that won't break the bank. They are all recent date codes. reel to reel tape 10,5 x .5 inch wide. Shipped with USPS Priority Mail. Tape was in a studio vault in Bill Moodys private studio. no flaking at all. in excellent shape. Cant test the tape for sure but it was kept in a vault that had a climate controlled atmosphere. THE BEST BALANCE OF WARMTH AND EXTENSION OF ANY 6AS7 TYPE TUBE - AND THE MOST TRANSPARENT AS WELL! PROFESSIONALLY MATCHED TO WITHIN 8% TRIODE TO TRIODE AND TUBE TO TUBE. PROFESSIONALLY TESTED ON WESTERN ELECTRIC KS15750 L3 WITH DAVEN BIASING AND DIGITAL PLATE CURRENT FOR EMISSIONS, NOISE, MICROPHONICS, TRANSCONDUCTANCE, SHORTS AND LEAKS. 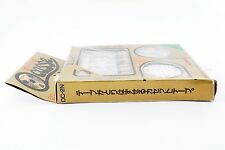 VINTAGE ORIGINAL MATSUSHITA 5AR4/GZ34 Vacuum Tube New-OLD STOCK JAPAN . 5654W X 4 (4 Tubes) JAN GE. Generally, preamplifier tubes last up to 5,000 hours, while power amplifier output tubes will last up to 3,000 hours. Near the end of their useful sonic life, aging vacuum tubes may degrade the sonic character of the product(s) they are used in. New PAIR of Electro-Harmonix GOLD 12AU7 tubes. These are difficult to find at a reasonable price, so this is an opportunity to obtain a world class tube at a price that won't break the bank. For push pull pairs of 6BQ4/EL84 6v6, 6L6, EL34 tubes etc. Can easily handle up to 500 volts. Frequency response was within 1 db from 20-40KHz on an oscilloscope using Bill Howland's version of the Pilot 902-aa amp, it can be found if you Google Evil Science 5881 amp. BIC Model 66 3-way loud speakers. 26" x 16" w x 13.5 depth. Walnut veneer has been varnished. Original owner. Replaced original 12's with 2 30-712F's from Pioneer CS-77a; also inspected by speaker technician & in excellent condition. RCA tube stereo power amplifier with 6BQ5 output tubes, from RCA stereo console, chassis is 9" x 5 1/4", c. 1964 with original RCA tubes, as pictured, untested good used original condition. All my joints are machined cut and they fit together perfectly and sit flat and square. 2 coats of Minwax wipe on Satin polyurethane finish. can also do with them no logo. I can do the large logo or smaller logo. These are NEW J.A.N. qualified General Electric 5670W twin triode vacuum tubes. Great low-level preamp valve. Black plate construction. Also known as the 2C51. The Western Electric 396A was the prototype for the 5670. One Quad (4) of high quality, hand picked NessTone EL34, tightly matched. They are beautiful sounding tubes. TESTED ON A ROETEST COMPUTER PROFESSIONAL TUBE TESTING SYSTEM. Matched with the MaxiMatcher2. High quality, sturdy construction and great tone! Full rich tone, very musical. It's designed to provide high gain output with an overall balanced tonal quality. 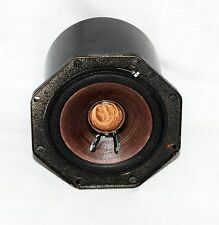 Vintage Epicure / Epi inverted dome tweeter, used. Shipping cost is for USPS Small Flat Rate Box. Reads 8.4 ohms. Sold as-is, but guaranteed not DOA. 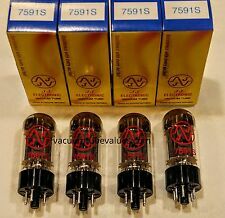 1 LOT OF 10 EACH JAN7586 NUVISTOR TRIODE TUBES NOS PRISTINE CONDITION. (1) 5U4GB Black Plate Rectifier Tube. These have black plates and each side tested above 56 with no more than 3 points difference between plates. These are strong and balanced USED tubes. A sample of test results can be seen in the pictures. WHITE Vacuum Tube Boxes. Heavy plain white boxes with dividers to cushion tube and hold secure. WHITE Boxes 100 pieces total NEW. If you are purchasing miniature tube sockets for 7, 8, or 9 pin. Black Walnut Side Rails (Cheeks) for your Pioneer RT-901 or RT-909. Two (2) side rails (cheeks) in Black Walnut. My solution is to create these beautiful Solid Black Walnut side panels that are secured using one of the rack mount holes. Set of 5 CERAMIC Octal vacuum tube sockets. BOTTOM MOUNT STYLE, THICKER CERAMIC VERSION. BOTTOM MOUNT STYLE. 1 1/2" mounting centers, requires a 1.040" mounting hole. INCLUDES MOUNTING HARDWARE! Huntley Audio L-100 Grille Inserts. Huntley Audio. Male and female Velcro tabs included for secure installation. The EL34B also tends to have more bass compared to the standard EL34. hand match power tubes within 5% for both plate current and transconductance. Having matched power tubes is important because itreduces hum from your amplifier. Matched set of 5 12BY7A. Up for sale are these 5 Channel Master Electron Tubes. Steel Stands Designed Specifically for JBL L100 Classic and Klipsch Heresy Pr. Many people want hot gadgets with lots of features and toys and cutting-edge technology. Others prefer to use tried-and-true products, many of which are no longer produced or supported. In the world of electronics, such collectors seek vintage equipment and parts. What makes these products ‘vintage’? The word simply means something old, but it also has a positive meaning as something of quality. So, in electronics, vintage refers to products produced 30 or more years ago but made to high standards. Collectors wanting to play music in older formats look for such products because often the sound quality is uniquely deep, warm, and rich. What products fall in the category of vintage electronics? Any older product used to play music, watch films or TV, listen to radio programs, make recordings, or customize the playback of media is a piece of vintage electronics. 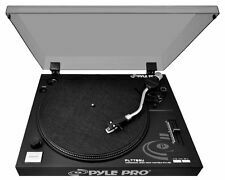 This includes complete audio and video systems, amplifiers, receivers, speakers, turntables, tape decks, televisions, and recording cameras. It also includes the parts and components needed to maintain and repair these systems. Vacuum tubes, for example, are an important part of many of these products, from amplifiers to televisions and radios. Since most of these are no longer manufactured, people will sometimes buy a product and use it for parts to repair something else. What makes these products electronic? The science of electronics is the study of controlling electrical energy. Electronic devices are products that use electricity to control their functions. Electricity itself powers many things, including lamps, for example. But a lamp is not controlled using electricity. A radio, however, uses electrical current to function. It controls the selection of a radio station and the volume of the sound playback using electrical circuits. This makes a radio, and other products like it, electronic. The same is true of record players, amplifiers, tape decks and other similar items. Are tape decks considered vintage? Tape decks are indeed vintage, and there is a wide variety of them available. Millions of such devices flooded the market in the latter half of the 20th century. For example, reel-to-reel tape recorders were extremely popular in the 1940s and 1950s. Then came the 8-Track followed by the compact cassette. There are millions of tapes available, but the players are no longer manufactured. To listen to these treasures of recorded music and sound, you must have one of these special, vintage devices.